Grab A Cup Of This Delightful Coffee And Enjoy The Balanced Notes Of Caramel, Berry And Honey. 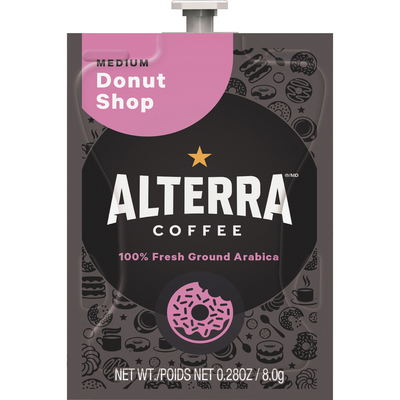 Medium And Balanced, Alterra Donut Shop Blend Is A Classic, Reinterpreted. Each Freshpack Contains The Exact Amount To Brew A Perfect Single Cup Of Coffee And Acts As The Brew Chamber For Your Drink So Your Cup Never Tastes Like The Last Beverage That Was Brewed. Freshpacks Are Used In Flavia Creation 150, Creation 200 And Creation 500 (All Sold Separately). Simply Slip The Pouch Into The Pack Door, And The Machine Pierces The Pack Seal To Create Your Delicious Beverage. For Single-Serve Sustainability, Innovative Pouches Are 100 Percent Recyclable Through Terracycle. More From The Manufacturer.